Tahiti Honeymoon - Quite simply, Tahiti and Her Islands are pure honeymoon heaven! Jaw-droppingly beautiful scenery and luxurious resorts with overwater bungalows are the order of the day here… need we say more…? Tahiti’s 118 beautiful islands are spread over 5 diverse archipelagos. Of these, 3 archipelagos have tourism infrastructure – the Society Archipelago, the Tuamotu Archipelago and the Marquesas Archipelago. For the perfect Tahitian honeymoon, we recommend visiting more than one archipelago for a wonderful contrast. Dramatic, lush and mountainous fringed by palm-lined beaches and crystal clear turquoise lagoons, Tahiti’s Society Islands include the island of Tahiti itself (home to the international airport and jumping off point for the other islands), Moorea, Bora Bora, Huahine and Taha’a. Each of these islands are home to luxurious honeymoon retreats. For pure honeymoon indulgence, look no further than Four Seasons Bora Bora, St Regis Bora Bora or Le Taha’a Island Resort & Spa. If rustic chic is more your style, you will love Moorea Pearl Resort & Spa, Bora Bora Pearl Beach Resort & Spa or Vahine Island to name but a few. Whether you are seeking a contemporary modern resort or a rustic hideaway, we can recommend the perfect Tahiti honeymoon hotel for you! A world apart from the Society Islands, Tahiti’s Tuamotu Islands – which include Tikehau, Manihi, Rangiroa and Fakarava - are perfect for honeymooners seeking a castaway island escape. These paradise low-lying atolls are a world apart from the lush and mountainous Society Islands – come here for rest and relaxation and a laid-back lifestyle. Choose one of these islands to play Robinson Crusoe for a few days at the start or end of your Tahitian honeymoon! Honeymooners in search of soft adventure should head to the wild and rugged Marquesas Islands – where the islands spectacular peaks and valleys, towering cliffs, raging waterfalls and distinct culture are sure to captivate even the hardened traveller! 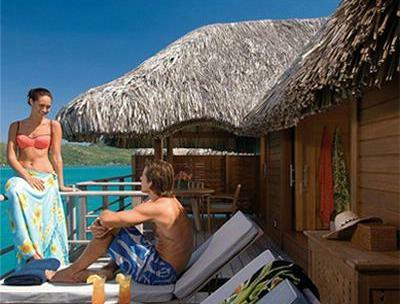 For the perfect luxury Tahitian honeymoon, stay for part of your time in an overwater bungalow. We recommend combining this with a beach or garden bungalow (some of which have private plunge pools or jacuzzis) for a wonderful contrast. Tahiti and Her Islands enjoys a warm tropical climate, with May to October being the perfect time to visit as it is the dry season. Other months are warm too, but tend to be more humid with greater chance of tropical showers.